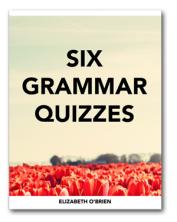 Are you ready for a grammar test? Great! You'll find the answers below the test. 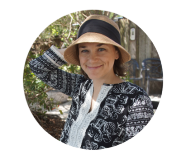 I've included a lot of helpful information and links in the answer section, so be sure to check that out. 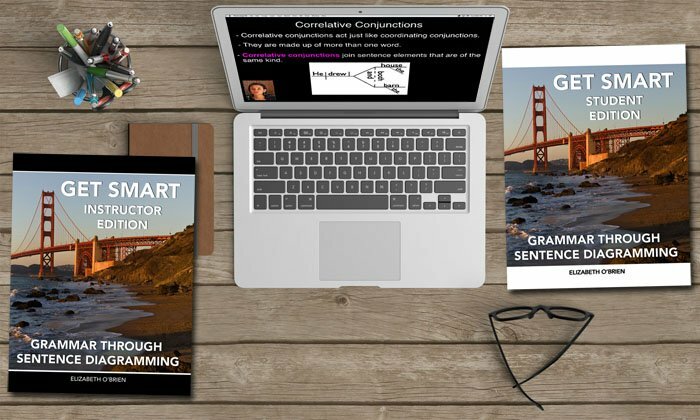 If you've only recently begun studying grammar, this test might be overwhelming for you. Hang in there! 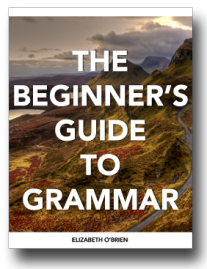 If you've already learned grammar, I hope that this grammar test will be a good review for you. 1. Is the following sentence punctuated properly? Why or why not? Whenever I eat caviar, I feel like a princess. 2. What are the eight parts of speech? 3. Which of the following sentences is correct? Why? A) I should of called my grandma. B) I should have called my grandma. 4. Identify the underlined words as a phrase or a clause. 5. What is the difference between the pronouns who and whom? 6. What are the two essential parts of every sentence? 7. Why is the following sentence incorrect? James and myself left the party early. 8. What's wrong with the following sentence? Can you name this type of error? Spitting out hot lava, my friend took photos as the volcano erupted. 9. Which of the following sentences is punctuated properly? Why? A) The students wanted indoor recess; the teachers wanted outdoor recess. B) The students wanted indoor recess, the teachers wanted outdoor recess. 10. What does it mean for a sentence to be written in the passive voice? Yes, that sentence is punctuated properly. It begins with a dependent adverb clause (Whenever I eat caviar), and is followed by an independent clause (I feel like a princess). 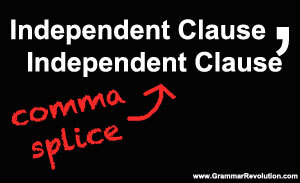 When dependent adverb clauses come before independent clauses, they need a comma after them. You can watch a video lesson about this punctuation rule here. 3. Verbs express actions or states of being. 4. Adjectives modify nouns and pronouns. 6. Prepositions describe the relationship between a noun and another word or element in the rest of the sentence. 8. Interjections express emotion and are not grammatically related to the rest of the sentence. Every word falls into one of these eight categories! Sentence B is correct. Should is a helping verb. That means that it's part of something called a verb phrase. 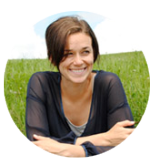 Verb phrases are only made up of helping verbs and main verbs. Called is the main verb in the verb phrase. 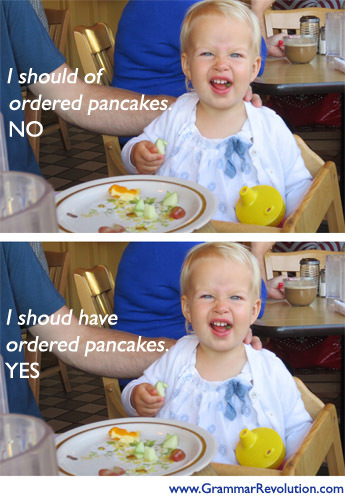 Have is the correct choice because it is also a helping verb, and it is part of the verb phrase. Of is a preposition, and prepositions have no business being in verb phrases. You can learn more about this mistake here if you'd like. A) Who made the mess is a clause. Clauses are groups of words that contain a subject and a verb. In this example, who is the subject and made is the verb. Who made the mess is a dependent adjective clause. B) Must have jumped is a phrase. Phrases are groups of words that lack either a subject or a verb. Must have jumped is a verb phrase. Who is a subject pronoun. That means that we use it for subjects. Who threw the frog on my head? 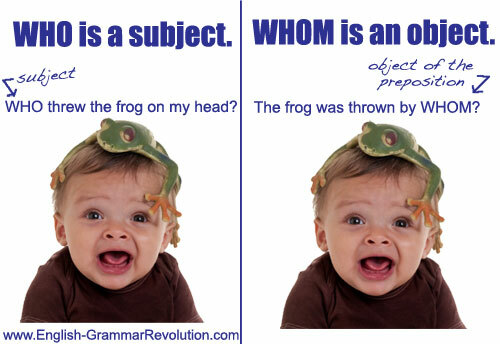 Whom is an object pronoun. That means that we use it for any object in a sentence (object of the preposition, direct object, indirect object…). You can read a more complete lesson about who and whom here. Every sentence needs to have a subject and a verb (predicate). Myself is not being used properly. In this sentence, it is trying to be a subject. 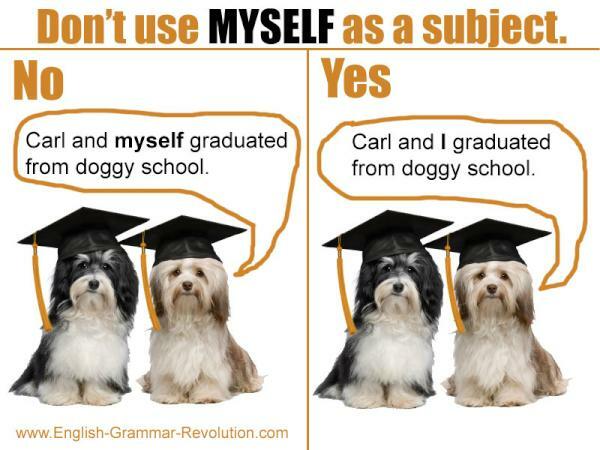 Myself is not a subject pronoun. 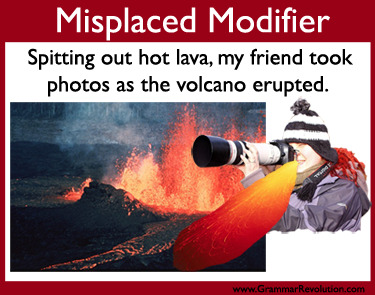 That's the job of the pronoun I.
Spitting out hot lava is modifying the word friend instead of the word volcano. It's called a misplaced modifier. Sentence A is correct. The sentence contains two independent clauses. Two independent clauses can be joined by either a semicolon or by a comma and a coordinating conjunction. When you use a comma to join two independent clauses, it's an error called a comma splice. Passive voice refers to sentences with a certain kind of verb called a transitive passive verb. These verbs are action verbs that transfer their action to the subject of the sentence. The subject (house) is receiving the action of the verb (was demolished). The letter had been delivered to the wrong address. The subject (letter) is receiving the action of the verb (had been delivered). I hope that you enjoyed that grammar test! I had fun making it for you. Although I teach English basics, I have no previous education in grammar as I was a real wild thing in my day. I am now catching up after all those wasted years, and I'm taking a level four TELF class. Your site has helped me so much. Gosh, the way you teach is really amazing. Seriously. Thank you.